Yep, Intel announced yet another quarterly dividend payment of $0.225 per share. That would be 8 straight payments of $0.225. For a position that had the promise of being a solid dividend growth investment, I’m very disappointed in this. I’ve been rather disappointed that Intel couldn’t even give a token increase of $0.01 at least once since the September 2012 payout. As a dividend growth investor that’s trying to reach financial independence through dividends, a dividends safety is priority 1A and its growth is priority 1B. Towards the end of 2013 I wasn’t completely fed up but I was getting there and wouldn’t have minded closing out my position. So I let Mr. Market make the decision for me and decided to sell call options on Intel until the shares were called away from me. I mentioned in my March dividend update post yesterday about a call option for Intel executing so let's go over the details. Intel’s struggles have been well documented and their being way late to the mobile game should have been a warning to proceed with caution. I was still very early in my investing “career” and thought that the issues facing Intel’s expansion into mobile devices were largely over blown. Heck, they’re the best chip marker in the world and have huge amounts of cash to throw at $&D. However, I have concerns about whether the mobile chips can even replace the further attrition of PC sales which offer higher price points and higher margins for Intel. So even if Intel does make serious inroads with respect to mobile devices, it might no be enough to make up for further declines in PC sales. The biggest reason that management has given for not increasing the dividend is because they are targeting a lower cash flow payout ratio than they currently have. With declines in revenue, EPS, and net income in 2013 compared to 2012 and a negative margin trend, I’m not sure how quickly they’ll be able to see growth in the underlying cash flow to allow for dividend growth. I purchased 100 shares of Intel in three different lots. I bought 15 shares on 11/22/2011 (I know bad idea in hindsight because of the commission), 30 shares on 12/14/2011 (yep, more commission mistakes), and 55 shares on 9/22/2012. After reinvesting dividends I received an additional 7.297 shares of Intel. All in all my total position size came to 107.297 shares plus two cash dividend payments of $24.14 each after I stopped automatic reinvestment. On March 19th, I sold a $25 strike call option for $0.26. After commission and fees I received $18 in option premium to do with as I pleased. As mentioned above the share price closed above $25 this past Firday which triggered the execution of the call option and subsequent sale of 100 shares. This left me with 7.297 share still under my control, so I decided to sell this this past Monday, March 31st. I sold the remaining shares for $25.9501 and received a total of $181.41 for my troubles. All in all Intel turned into a decent holding but definitely not a great investment. 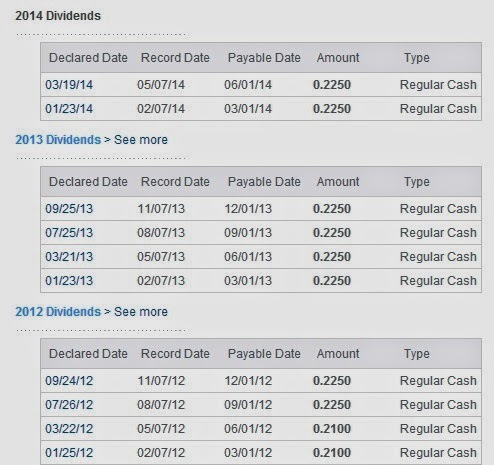 I earned a 7.68% annualized return from my holding in Intel which isn't bad considering the dividend never grew. I'm just glad that I learned a lesson without paying a price for that lesson. Profitable lessons are always better than losses. My total return came to 14.81%. Proceeds and return do not include taxes but do include commission and fees. Honestly if management had at least given a token increase I'd probably still be an owner today. However, no increase and with it seeming if every quarter management kept promising big results with mobile in the next quarter, or two quarters from now. Every earnings call always had the promise of more to come but that's all it's been so far, promise. I don't feel burned by Intel in the least and if they actually can improve on mobile and start to grow the company and most importantly the dividend then I wouldn't rule out the possibility of owning shares in the future. For now though it feels good to not have to worry about the promise of next quarter getting pushed to the next one. This sale decreased my forward 12-month dividends to $4,046.48 and I'll be looking for opportunities to invest the proceeds elsewhere. Do you own shares of Intel? Are you disappointed with the lack of a dividend increase? Thats not a bad return at all, JC. Are you looking at replacing your position with other tech stock or going for some other sector? Considering it was a fairly disappointing holding the IRR and total return was still decent. Of course just holding SPY would have been much better. Most likely it'll be from another sector as I'm still kind of wary of tech stocks as DG holdings. It's pretty hard to remain one of the best of breed companies for multiple decades in a field that moves as quickly as tech. Intel is a prime example. Just 10-15 years ago they were without a doubt the best company out there for chips/processors. But they completely missed on moving to mobile early and now they're suffering. I want something that's more consistent and easier to predict from year to year. Will KO sell more sugar water in 2014 than 2013, I'm 99% sure they will and turn a higher profit. Will INTC sell more processors, who knows? KO will continue to sell sugar water - and Ive been thinking more about it esp with all the recent articles making rounds between you, IncomeSurfer, the fav stock collection from DGSI etc. One other disruptive source could be this SodaStream thing - I dont know much about it, but some people claim that its great. Of course, it wont take down a company like KO (or PEP for that matter), but it could put a little dent into their earnings. The GMCR deal with KO still seems a bit odd to me. I need to find out what exactly KO's plans are. My guess is that it's going to be for coffee/tea and other cold beverages but I'm not sure if they'll be able to do anything with the carbonated brands. Sodastream seems like it would have been a better fit, although that could possibly eat into KO's CSD sales by partnering with Sodastream to sell their syrups. One of my wife's friends has a Sodastream and while it's neat and I could see if coming in handy, I prefer to just buy the cans/bottles whenever I want to have some soda. Passive, You should consider going with MSFT, if you want to stay with tech...dividend continues to grow and let's face it they are here to stay....though growth in revs and eps may be single digits, the fact that they have excess cash and seriously are commited to sharing with shareholders...I personally think that this is the way to go if I were an investor in INTC. Special mention should also be for AAPL which going forward should be a future DGI stock. I own some MSFT already and I wouldn't mind adding to my position there but the share price has taken quite a big jump over the last month or so. I'll have to reevaluate and see how it's valuation stands but MSFT is definitely an idea for staying in tech. I've considered AAPL too and need to run through a full analysis on them. You managed to get a decent return out of INTC. Good work JC. I think INTC is having an identity crisis. It's not a growth innovator, it's not a young upstart. It's a legacy tech company, which (in my opinion) trades at more of a valuation premium than it aught. I was happy to walk away with a decent return considering how lousy the company has been. I just plain got tired of waiting for the next quarter to come. If management was more open about their operations and realistic expectations I'd probably give them a bit of leeway but they kept promising next quarter which never materialized. They're at a crossroads and need to make a decision on what to do and go full bore with it, for better or worse. Not surprised to see this JC! I'm glad I exited back in August. Once a position breaks the requirements I've set forth for my DG investments, there can be no holding on or emotions. Sell and move forward. Best of luck as you find other avenues for that cash! I've got some ideas in mind, but unfortunately like a lot of the companies I'm interested in they're a bit overvalued. There's some that are in the ballpark but chances are I'll make at least one purchase this month. I'd love to make more but I don't know if that's on the horizon. I'm wavering between an investment in Intel or Qualcomm. That Intel does not increase its dividends - I find this really weak! Even AT & T increased its dividend, even if it's only $ 0.01! Obviously I'm not a big fan of INTC right now. Qualcomm is interesting and they've been doing very well with the smartphone/tablet conversion. Roadmap2Retire has some articles on Qualcomm so he can probably give you some more information that I can. The fact that INTC didn't even give a token increase is annoying. Even more so since it's now 8 quarters at the same rate, although the DG streak is still in tact as long as they increase the 4Q 2014 payment. I have been eyeing my INTC position for a while now. Like you I am annoyed they haven't raised their dividend in over two years. I am trying to decide if I should give them until the end of the year. Have you considered CSCO? They have a short dividend growth streak, but the hardware they provide will be necessary for a long time. I looked at CSCO a while ago and was pretty close to buying shares. I think CSCO is pretty good with the "Internet of Everything" coming on board. More hardware is going to be needed and CSCO should be there to help out. I was planning on giving INTC a bit more leeway but I frankly just got tired of it always being next quarter when things would take off. At least be honest with shareholders. Either they're hiding information because it's bad or management is way out of touch with when market penetration could happen. So I just cut my losses, well, cut them loose and luckily walked away with extra money. 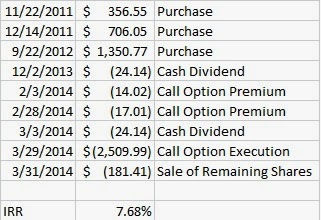 I also sold 2 INTC calls but they are longer dated for around Oct. Intel's dividend policy has more to do with cash flow % than just to keep increasing dividends to keep their record intact. This makes them more speculative. I'm giving them a little longer to take some mobile market share but will be watching for another opportunity for selling more calls. Their price has been on an uptrend lately. On another note, I'm looking into adding a small position in FDO. I don't know if you've looked into them much but they would be my request for an analysis on. I've never looked into FDO but I was intrigued when I saw, I think it was DGSI, post about them. I'm working on getting the data and will hopefully get an analysis up on them within the next week. I own INTC as well but will be giving them a little longer. You are right they were late to the mobile market but their processors are bar none the best. I'm honestly just frustrated in management. I was fine with them being late to mobile, but what really irked me was that they kept promising that the next quarter, or 2nd of half next year they'd show big improvements but that just kept getting delayed. I'd still invest in them if they get back to being a real DG company but for now I'm glad to be out and watching from the sidelines.